On the one hand a cage is a real thing, on the other hand you can understand it as a metaphor for various existential conditions. The film Cage attempts to express and create both meanings. 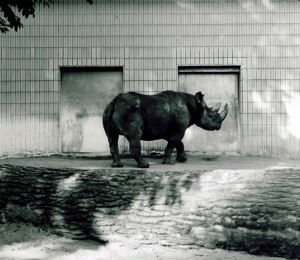 The basic material of the film are two 35 mm b&w shots, which were filmed in the zoo in Frankfurt in the rhinoceros cage. With the help of a complex metric montage, which is based on 3,360 cuts, the naturalism of the representational images and movements is radically deconstructed. Karl Kels was born in 1960 in Duesseldorf. He studied at the Staedelschule in Frankfurt/Main from 1980-1985. He teaches at art academies and works as a freelance artist in the areas of film, photography and installation. His films include: Haystacks (Heuballen, 1981), Condensation Trail (Kondensstreifen, 1982), Sluice (Schleuse, 1983), Rhinoceroses (Nashoerner, 1987), Starlings (Stare, 1991), Hippopotamuses (Flusspferde, 1993), Oven (Ofen, 1994), Elephants (Elefanten, 2000), Prince Hotel (1987/2003), Sidewalk (2008), and Cage (Kaefig, 2009).